Stone fruits are fickle little things. They can be at once a juicy sweet perfection, and yet also a rock hard, gritty and sour disappointment. They taunt us endlessly with their possibilities, rarely consistent and yet so tempting. The tiny purple Italian prune plum has the means to bridge this gap between hope and despair in the mere fact that it simply begs to be cooked in order to reach full enjoyment. The flesh when raw is acceptable; it’s fairly sweet with a decent amount of juice, but given just a brief turn in a warm skillet and it becomes something sublime and intoxicating. Poach it with some deep red wine and the experience soars. These days I’m needing all I can get to fill the yawning gap inside me, brought about by Harmon’s cancer diagnosis. The turn to Fall is often one choked with melancholy for me; the loss of summer’s warmth and the mountains of fresh produce, the chill in the air and shutting down the flower beds. Our September has been more glorious than imaginable. We’ve been graced with warm and languid days followed by cool crisp nights that begged for open windows and a light blanket. In our semi-rural neighborhood of open fields and ponds, the geese have gathered in massive droves and flown their missions overhead by the hundreds with noisy and eye-catching appeal. The field mice are much more active, giving our intrepid hunter an endless supply of ‘gifts’ to try and bring to us. Baskets of winter squash are appearing in the Farmers Markets. There are shocks of color through the trees as the thick greens of summer give way to Autumn’s richly burnished palate. But I feel like I am in a state of flux. We just have no idea how the last course of Harmon’s life will go, and for me, I just want to be here with him soaking up what remains of our time together. I feel like Autumn will pass by my windows while I snuggle my old friend and begin to consider life without him. It’s slightly ironic, and painfully so that in this transition of seasons outside, within the walls of our life we are transitioning as well from life to death, a golden leaf withering in front of our eyes into the silence of eternal winter. So the need for something to soothe is evident. I don’t want much these days, wishing for little effort in exchange for nutritional gain. There were delicious and knobby Oatmeal Sweet Potato Muffins that spoke of Fall, tinged with cinnamon and warmth. I found an extremely deep sense of comfort in a simple hard-boiled egg and warmed cooked potato sprinkled with a dusting of sea salt. A package of tiny gnocchi dumplings became crispy and soothing after a sear in brown butter and topped with tender sage leaves, and in the midst of the past few days, where my tears have been so close to the surface that most anything can bring them springing to life, a few of these poached plums have been a perfect foil to fill the pit in my stomach that threatens to engulf me. I sneak them from the bowl in the fridge, where they sat silently as their original use for a delicious cake fell to the wayside while sorrow took over. After a few days, and some stealth tactics of enjoyment, I did manage to cook up a quaint and tiny little coffee cake, richly hued in these dark purple slabs, crunchy with almonds. This is a coffee cake unlike any coffee cake that I’ve known before. Thin, somewhat crisp, not too sweet and thoughtfully simple, is a lesson in cake’s alter ego, that which doesn’t comprise itself of towering airy layers sporting thick rolls of buttercream. It can shed that cloying nature, throw off the layer-icing-layer makeup and just be fabulous without fuss. 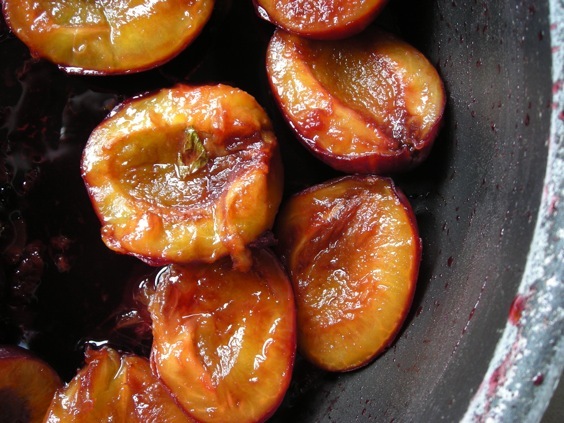 You don’t even need rich and succulent wine soaked prune plums to make it; any ol’ plum will do, or perhaps a good firm pear or a gently caramelized apple. Wash, split and pit any quantity of prune plums- I used a full container from the grocer; it probably had about 1-1/2# in it. In a deep skillet, combine 2 T. chunky fruit jam of choice (I used Thomson’s Sweet Cherry Preserves), 2 T. red wine (I used a syrah) and 2 T. of water. Heat gently to melt jam, stirring to combine everything. 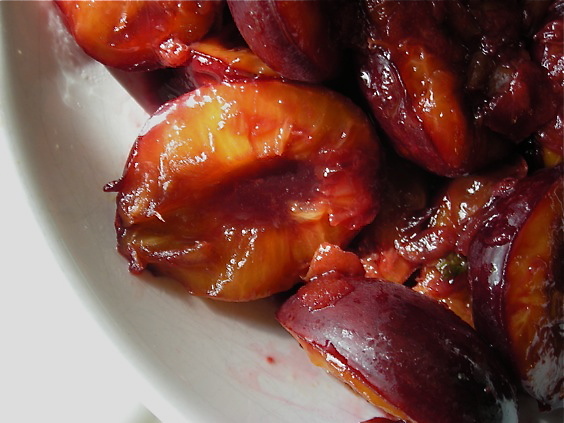 When warm and a few bubbles have been seen around the edges, add as many of the halved plums as you can, cut side down. Cook gently, without stirring, for about 5 minutes. Turn plums over. Cook about 2-3 more minutes and remove to a bowl. Add remaining plums and cook, adding to bowl when done. Pour any juices over the plums and gently turn to coat the fruit. Allow to sit as long as you can. The more time, the deeper the flavor. Chill in fridge. Heat oven to 350°. Spray a 9-inch springform pan with cooking spray. In the bowl of a food processor, combine the sugar and almonds and process until almonds are ground. Add flour, baking soda and salt and pulse twice to combine. Add butter and pulse until mixture resembles coarse sand. Add in egg and yolk and extract and pulse until combined. Spread batter in pan and top with poached plums, pressing them into the batter. Bake for 40-50 minutes or until cake is firm. Allow to cool for 15 minutes or more, then release the spring. This cake could be better, I’m sure of it. While always wary of using a food processor to make a batter, thinking that the spinning blades tend towards overkill more than gently combining, I would be interested in doing this in a different method. The cake, while good, was a bit dense. The batter quantity is small, and 40 minutes in the oven resulted in browned and crisp edges. I love that on a cake, but many don’t. 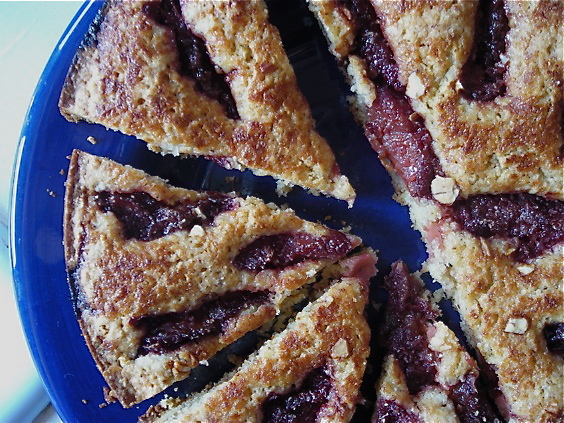 It was, with it’s almond base and simple design, an amazing flavor. It might come out slightly better if baked in a loaf pan too. At any rate, there is much to experiment with this recipe. 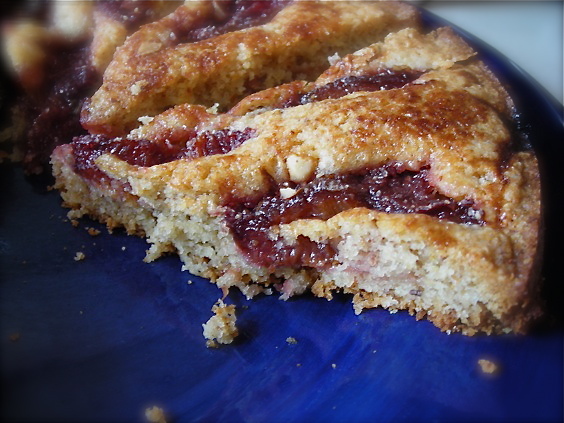 Tags: coffee cake, fall, italian prune plums, red wine. Excellent idea! They are so versatile once you’ve got them cooked. We’ve eaten them in yogurt, on oatmeal and of course, with our fingers. They would be good in muffins too. The flavor concentrates over time and they release more of their juice. One thing I have noticed that once the plums are cooked, the skin becomes a bit tough. We’ve been stripping the skins off prior to eating. They are delightfully tender. Thank you for your kind words. Food, in it’s simplicity, is a huge solace, and keeping up with the blog takes my mind off of my old friend. He is doing a bit better these days, having been prescribed a steroid, but I fear it will lull me into a complacency that I don’t want. Your recipe has given me inspiration, Kate. I have a box full of prune plums, purchased on a whim, and I haven’t done a thing with them. I’ve decided to use your idea to poach all of them in wine, store them in the refrigerator and go from there. I know your heart is heavy at this time. I can empathize with you. How nice of you to still take the time to share your love of food with readers of your blog. Thank you.